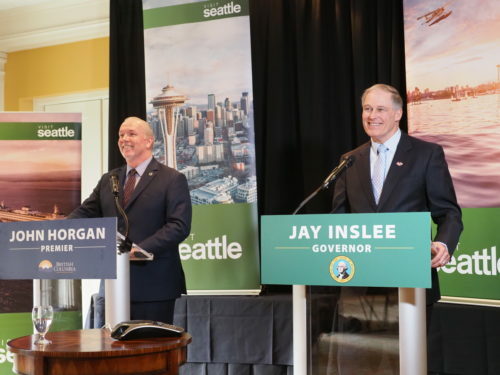 This week, Washington Governor Jay Inslee is hosting British Columbia Premier John Horgan, the leader of the Evergreen State’s northern neighbor, as part of an effort to strengthen cross-border ties in this great green region we call Cascadia. Horgan and Inslee participated in several events yesterday in Seattle and several more events are planned for today at the Capitol in Olympia, including a special address by Horgan to a joint session of the Washington State Legislature. This is not the first meeting between the two men. They have become good friends since Horgan’s ascension to the premiership in British Columbia. One of the cross-border initiatives the two leaders are very passionate about is creating a high speed rail link between Vancouver, British Columbia and Seattle, Washington, with multiple daily roundtrips. A new high speed train would offer faster and more frequent service than Amtrak Cascades does today. While our team at the Northwest Progressive Institute strongly supports Horgan and Inslee’s vision of a high speed rail network for Cascadia, we want everyone to know we are in danger of losing our existing Amtrak Cascades service next year if we don’t stop Tim Eyman’s latest incredibly destructive initiative, I-976. Many people don’t know that Amtrak Cascades is actually a service of the States of Washington and Oregon. The line is operated by Amtrak, but most of the funding for it comes from the state level. WSDOT’s rail programs, which include Amtrak Cascades, get their funding from what is known as the Multimodal Account. I-976 would eliminate the principal revenue sources for the Multimodal Account. With I-976 destined to appear before Washington voters this autumn, I asked Inslee and Horgan to comment on the prospect of Amtrak Cascades service between Seattle and Vancouver being eliminated at their media availability today in Seattle. Below is a transcript of my question and their answers. NPI’s ANDREW VILLENEUVE: A question for both of you. Anti-tax activist Tim Eyman has proposed a statewide initiative that would eliminate most of the funding Washington taxpayers provide to operate Amtrak Cascades. Voters will vote on it this fall. Governor Inslee, what is your position on this initiative? And Premier Horgan, what is the impact to our cross border relationship if the Amtrak Cascades rail link between Seattle and Vancouver goes away? GOVERNOR INSLEE: Well, you had me when you said Tim Eyman, so you don’t have to go a lot further. We need rail transport, and we’re going to continue our support in that regard. PREMIER HORGAN: And from our perspective… Governor Inslee invited me to join with the High Speed Corridor initiative that he has undertaken. We contributed, last year, $300,000 to the first phase of the study. We’re here today to announce an additional $300,000 towards the study to make connectivity between our two jurisdictions a tangible, real thing. We envision high speed rail coming from Seattle into the Lower Mainland with a terminus in Surrey, the fastest growing community in the Lower Mainland, which would connect to our SkyTrain and other public infrastructure to get to our airport, to get to Downtown Vancouver, and out to the [Fraser River] Valley. Quite the contrary to saying no to more connections through rail… we want to see better and faster connections through rail! GOVERNOR INSLEE: So, our preliminary review has shown this could generate 1.8 million riders in the first few years. So we are moving to the next step, which today is to look at a governance structure for a potential rail line. And in my budget, I’ve put in over three million dollars to establish a potential governance structure. We’re confident that this is… we’re optimistic enough that [we’re] justified [in] taking this next step. And that’s based on optimism. It’s based on an optimistic vision of the growth we’re going to have in British Columbia and Washington because we are a world-class community across that border. We have world-class growth. We have a hundred thousand-plus moving here every year or two. And we have to have more dense and successful transportation corridors. And if you’ve traveled the world, and looked at what high speed rail can do in these [kind of] corridors, you will say, our people deserve this. Our people who are world class innovators, world-class inventors, world class inventors, world class cosmopolitans, [living in places] that the world is coming to… we deserve high-speed rail in my view, and I’m glad we’re pursuing this option. This is what real leadership looks and sounds like. Rather than simply playing defense against road warriors like Tim Eyman, Governor Inslee is going on offense in partnership with Premier Horgan, proposing better and faster rail service across the United States-Canada border at the Peace Arch. As Governor Inslee said, we need rail transport. Today, Amtrak Cascades provides our only international rail link to Vancouver, British Columbia. It’s a valuable service and one we don’t want to lose as we pursue development of a high speed rail line. It is essential that we protect Amtrak Cascades, Sound Transit’s ST3 system expansion, King County Metro service hours, ferry service, and transportation investments across our state from Tim Eyman’s self-serving demolition derby. Please join NPI in taking a position against I-976, either as an individual or on behalf an organization that you represent. Together, we can unite Washington in opposition to this harmful initiative and keep our state and region moving forward. © 2019 The Northwest Progressive Institute. The Cascadia Advocate loaded in 0.214 seconds.